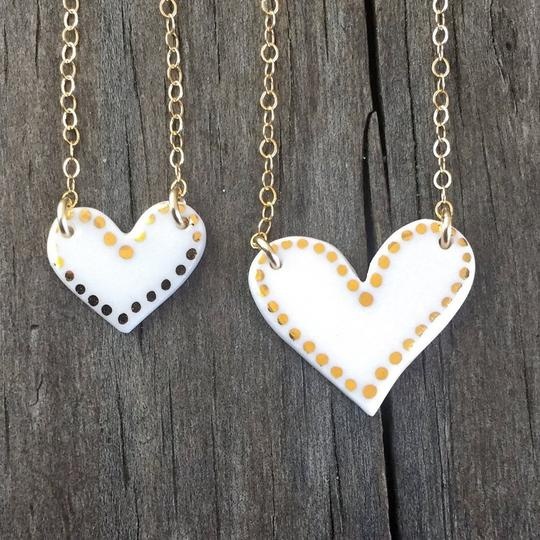 Dot Bordered Porcelain Heart is hand designed with a kiln-fired 22k gold overglaze. Leaf pendant measures 3/4" long & 16" chanin that is goldfil. Remnant Studios is a non-profit 501(c)3 corporation started in 2014 with the purpose of raising funds to fight and bring awareness to the world-wide crisis of human slavery and trafficking. We do this by making and selling hand-crafted porcelain jewelry. Our studio is in the great city of Austin, TX, and we make our jewelry from raw clay. To enhance the porcelain’s beautiful and delicate whiteness, we incorporate design elements such as water-etching, the use of colored and metal glazes and lusters, and by sometimes incorporating other materials such as leather. How awesome is Quinn with Remnant Studios??? As of 10/2018 $50,000 has been donated to A21, The Refuge for DMST & Compasio-Global Child Advocates!!!! Wear beautiful jewelry & help end human slavery!!!! !